» Browse all new Beading e-patterns. Amethyst beads and rondelles gracefully encircle the neck in a display of passion with five silver hearts. 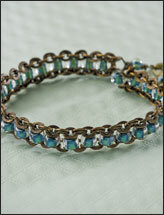 This e-pattern was originally published in the February 2009 issue of Simply Beads magazine. Size: 16 1/4" long, including clasp, plus a 3" extender chain. Beading Pattern Downloads for You & Your Home! They say that clothes make the man, so ... does jewelry make the woman? We don't know for sure, but beading projects sure are fun to create! 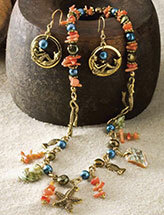 Put more sparkle in your life with our beaded jewelry patterns and beading projects. There's nothing better than getting a compliment on a beautiful piece of beaded jewelry that you made yourself. Use our beading downloads to create handmade beaded jewelry, and get ready to impress your friends with your beading skills. Beading projects are great for the holidays. 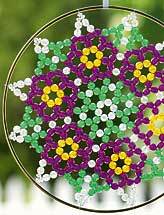 You'll find lots of beading patterns to dress up your tree or deck out the holiday table. Handmade touches help make holidays special, and we've got lots of beading patterns to inspire you. With our easily downloadable beading patterns, you'll instantly have your design. All you need to do after you download your project is go to the bead store -- and who doesn't love to do that?